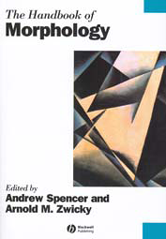 Editor/Author Spencer andrew and Zwicky, Arnold M.
Interest in morphology has undergone rapid growth over the past two decades and the area is now seen as crucially important, both in relation to other aspects of grammar and in relation to other disciplines. - Brings together articles by authors at the forefront of current morphology research. - Covers traditional issues as well as specific questions that have more recently become the focus of attention. - Explores the role of morphology in a wider perspective: language change, psycholinguistics, and language acquisition. - Zwicky is considered by many to be the leading figure in morphology.